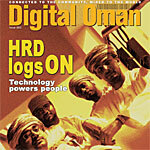 The first issue of Digital Oman (DO) received a warm welcome and a large number of people wrote in - who on the whole appear to be well-informed, technically-literate, tough-minded individuals – with useful comments and suggestions. Initial feedback tells us that our readers understand many of today’s ICT issues/problems - or are aware of their existence - and what they want is information and guidance on these topics. Indeed, many of the articles in Issue 02 illustrate how Oman’spositioning itself to meet the challenges of the Ethernet and Wi-fi Age. We’ve lined up Mark Hobbs who covers ICT and human resource development; Table Talk goes toe to- toe with Marc de Marcillac, Omantel’s newlyappointed Sales Director; Andrew Rae looks at intellectual property rights; Jamal Al Asmi tells us how to buy a PC; Dr. Graham Smith suggests we leave the lap top at home and lose 12 kilos; Rachael Church analyses cricket and football websites; Mohammed Al Ghassani continues his paperless office theme; the Information Technology Technical Secretariat (ITTS) shines the spotlight on ICT and its impact on social and economic development; Ian Sharpe files a report from E3 in Los Angeles; Raza Ashraf tells an Enterprise Resource Planning tale, plus we’ve readers’ letters, a round up of ICT news and a whole lot more. DO aims to shoot straight from the hip and be on the level with its readers, and over time, we’ll refine the magazine’s content to reflect what our readers, supporters and the marketplace wants. The balance of opinion, commentary, articles, news, interviews and product reviews is likely to change from issue to issue - but what won’t change is our commitment to deliver the best possible ICT information that’s relevant to our readers. » ICT & Economic Social Dev.